With rumours about Greg Inglis’ playing future swirling, Fifita weighed in with – dare I say it – some pretty sage words. “I think everyone should leave GI be for a bit,” Fifita was quoted as saying by Fairfax (or Nine, or whatever we’re calling the publishers of the SMH these days). Spot on, Andrew Fifita. Geez, didn’t think I’d ever write those words. Inglis is taking a bit of time out, with reports he’s struggling with injury, may not have hit his ideal playing weight, and was crook last week due to a suspect takeaway feed. As a result, Wayne Bennett gave GI the week off, leading to rampant speculation that the Queensland captain has played his last game. His club coach didn’t exactly put such speculation to bed on Friday, when he confirmed that Inglis’ left shoulder is so affected by arthritis that he can’t lift it over his head. “It flares up and it goes from bad to good to worse. (It’s) unpredictable, all over the shop with it,” Bennett said. A totalled shoulder – and you kinda need shoulders in the game of rugby league. Except the 32-year-old wouldn’t be the first player to be nursed through the final years of his career. In fact, by the time you hit your 30s, if you’re lucky enough to still be playing, you’re likely doing so with the aid of needles or a seriously reduced training regime – or both. Bennett won’t allow Inglis to needle-up to get right, so that means he needs to be managed with extended recovery. Perhaps the Bunnies skipper simply won’t turn out each week, the club and coach instead having to select the best times to unleash him. Ordinarily, that could be considered somewhat selfish – if you’re not right to play anymore, it’s time to hang up the boots. 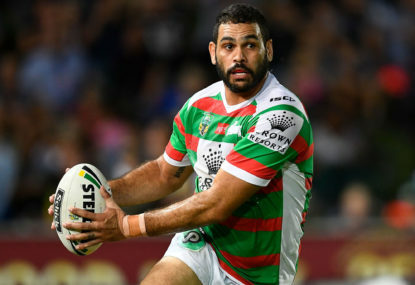 But Inglis’ shoulder is an existing injury, meaning the $1.5 million he’s reportedly on until the end of next year will be taken out of the salary cap whether he retires today or in October 2020. 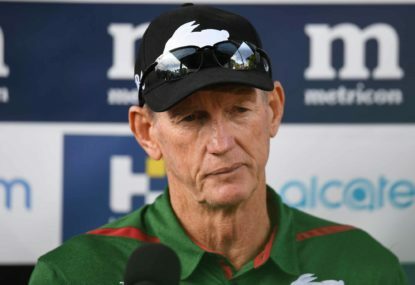 Which means there’s really no benefit to the club for him to give it away now – particularly since he’s set to move into an ambassadorial role in retirement, so he’ll still be receiving a healthy annual salary from South Sydney Football Club. So, frustrating though it may be for fans, if Inglis is to see out his final contract, it’s likely to be a bit of a stop-start affair, and he’ll never quite be back at his best. But Greg Inglis at 90 per cent is still devastating. 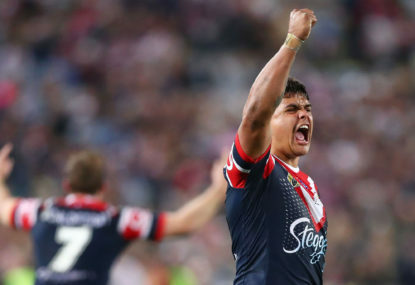 Plenty have pointed to his Origin 1 performance last year, when he led from the front and could have been named man of the match in a losing team. I like to re-watch his second try against the Storm in the 2018 finals. Adam Reynolds put up a bomb and Suliasi Vunivalu leapt high to take it. But big GI snatched the ball from Vunivalu’s clutches, looked up, and saw Billy Slater standing in front of him. I swear, GI smiled at that moment and then ran straight at his rep and former club teammate, bulldozing over the top of Slater to score. It was everything Greg Inglis does in three seconds – the leap, the skills, the footwork, the raw power. Since then, he’s played a total of four games. Obviously I don’t know exactly what has happened in the interim (although I can tell you the chicken-wing tackle he copped in that game against Melbourne was on his right shoulder). But just four games ago, GI was putting in the kind of performances that win games (well, games against teams that aren’t NSW or the Storm). He probably won’t be able to do it on a weekly basis ever again, but I’d hazard a guess that he can still do it. Fingers crossed, Greg Inglis takes the time he needs – maybe it’s another week, maybe it’s a month or two – and comes back with his mind and body in a place where he can give us fans a final few shows.